Bright, sunny, hot, happy, and energy-filled—that was Saturday of Franklin’s Main Street Festival 2014. Expected in town—130,000 visitors to crowd Main Street and look at over 200 arts and crafts booths—jewelry, pottery, photography, leatherwork, woodworking, garden accents, and birdhouses. And books! 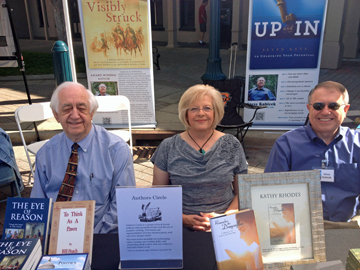 I am with the Middle Tennessee Authors Circle this weekend in a booth on the square in front of Fifth Third Bank, selling Remember the Dragonflies: A Memoir of Grief and Healing. 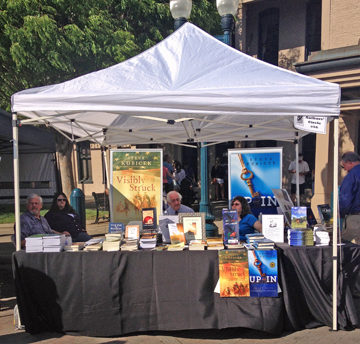 I was busy talking with other writers and with friends who stopped by the booth — Bob, Yvonne, Ken, Vicki, Don, Grace…great to see you all! And I did get a chance to go and inch through the crowds and browse. I had to buy a new birdhouse. I buy one every year at the festival. See the little dragonflies? Love them both! 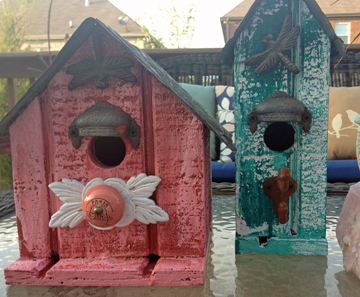 This year, the vendor had birdhouses with metal dragonflies on them! I’m sure I squealed when I walked into the booth and saw the lovely colors…and the dragonflies. If you live near Franklin, come see me Sunday, April 27 at the Main Street Festival. I’ll be there from 11 till 3. I’d love to show you my book and chat a minute! 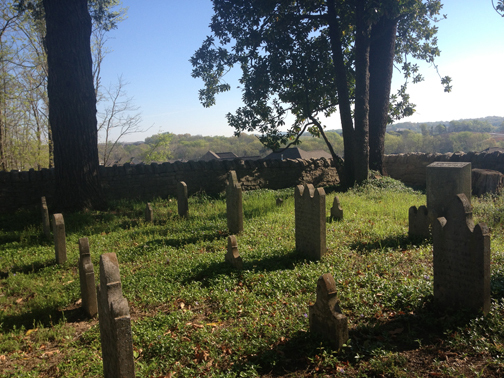 It’s Easter Sunday, and I hike once again to that old cemetery—the one that’s in my neighborhood. I want to see if the lilies-of-the valley are blooming yet. They weren’t last Sunday. In Wades Grove where Lequire Lane abruptly ends just past its intersection with Dubose Court, there’s a field full of dandelions and clover off to the right. Across the slope is a wide path that goes up a hill between saplings and tall trees just barely getting their leaves. I trudge up the steep incline, going higher than the houses on Dubose. A blue heron flies over. She’s a solitary bird, looking for peace within. The great blue heron brings the message that I should listen to the inner callings of my heart, follow my own unique path in life, and co-create my own circumstances. And then rise and soar when I choose. 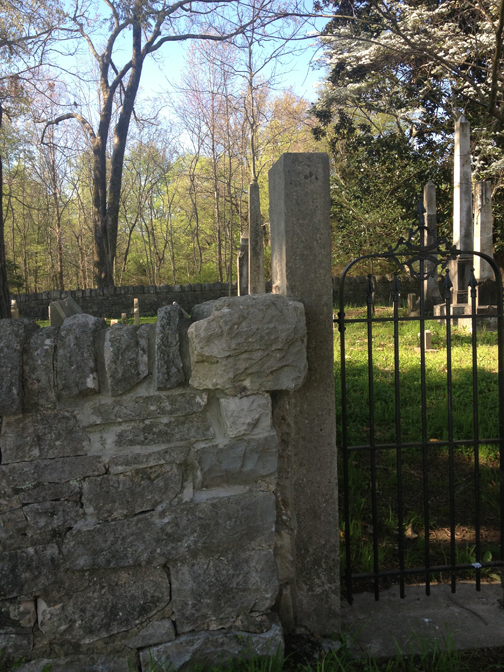 At the top of the hill is the cemetery surrounded by an old rock wall. A black iron gate is the way in. The Wades and Duboses who used to walk this land now reside here under it, yet above all of us who have houses down in the real world in a subdivision named for their family. The ground is covered with periwinkle, little blue flowers everywhere. Snowdrops are just beginning to bloom in tiny, white, bell-like flowers. Daffodils stretch in a long line, tossing their yellow heads in the wind. I wonder if someone from an olden age planted them here. It used to be this way long ago when all old homeplaces had daffodils around their yards, and little children laughed and played inside them and trees towered over them, and when the folks died off and their house rotted into oblivion, the daffodils remained, returning every year and lining up in a square to announce the season of rebirth and new life. Now old trees rise up inside that gray stone fence—trees that speak of long life. Three giant walnuts, maybe a century old. 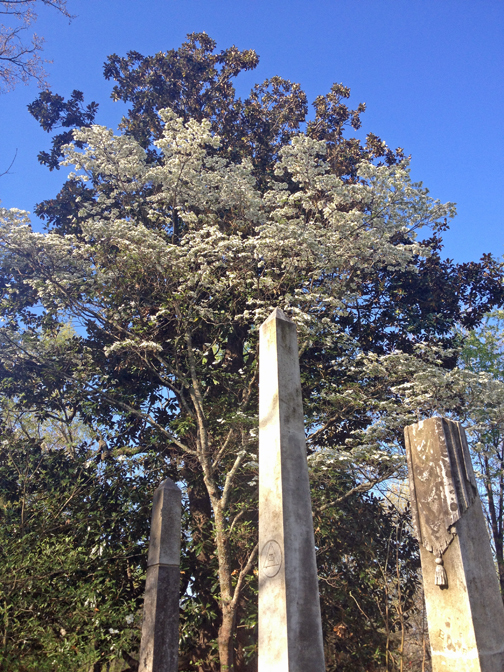 An ancient spruce and two dogwoods in bloom. In one corner, a magnolia stands the tallest with its thick gnarled limbs stretching out over the people here. Someone cut down another magnolia in front of the old one, and five new trunks have grown up from it. No leaves, but the tree has long slender velvet tips at the ends of each branch ready to bloom out in fragrant satin flower. 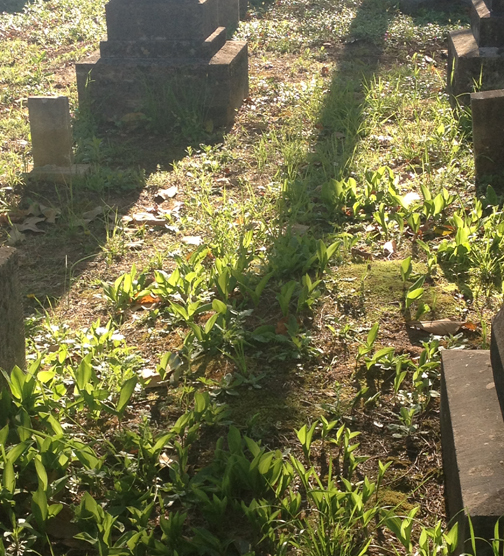 The gravestones are all lined up, like school children getting into formation to go outside for recess. Patty Ann, Elizabeth, George, Harriet, Henry, Mary Lou, Lucy, Carolyn—Wade people, adults and children, who lived and died in the 1800s and early 1900s, a century ago. The last time someone was buried here was in 1936. I walk by Lucy Wade and her husband William Dubose. Lucy died at thirty three, leaving an eleven-year-old daughter, Carolyn. Carolyn, born in Spring Hill in 1883 and died in Atlanta in 1912, was “A Perfect Woman,” according to her tombstone. She was only twenty-nine and didn’t have a chance to become colored by life. Henry Pointer Wade, 1828-1907, was “A Good Man.” That’s what my Charlie wanted people to remember about him. I sit on the bottom concrete ledge of Burke Bond’s tall spire. Burke died in 1889, and according to his inscription, he knew that his Redeemer liveth. The sun filters in through new spring leaves. I watch the shadows fall—the old walnut and spruce lay across the aging, blackening tombstones inscribed with names and spans of years people walked and worked and played here. I walk over to the eastern wall of rock and look out over all the newly built houses in Wades Grove. Earth in the distance has been cleared of old trees—cherry, cedar, crab apple, sweet gum, sycamore—for even more homes. And farther out beyond the neighborhood’s reaches is the school our children are zoned for. Children here inside the stone fence, children over there in the brick building. People up here under obelisks, people down there on grazing land mowing grass. Land that moves forward. I think of my own family land down in Mississippi. Five generations have owned that red-clay dirt. I’m up now, and when my time comes, I will pass it on to my children. I imagine the Wade children played on this land like I played on ours during summer visits to the grandparents when I was a little girl. I wonder if the Wade children went with their grandpa late afternoons to bring the cows in. I imagine the children played in Aenon Creek—maybe they even dammed it up and built a pond like my cousins and I did on our stream. I wonder if the Wade children ever tried to dig up a grave with a tin can here, like my cousins and I did in the family cemetery on our land. I wonder if their grandma took them to the cemetery and showed them the stones and told them the old, old stories of the ones passed. There is peace here in the sleep of the old. And quiet, except for a lawn mower on the court below. The lilies aren’t blooming. Yet. From up here high on the hill, I can see how it was, how it is, and how it will be. There’s something about standing here on holy ground between heaven and earth and seeing who used to be here and who is here now, and there’s a sense of comfort that life’s long lines go on. I grew up in a house with asbestos shingles. Most of the houses on my street were built with these hard, brittle tiles. It was common for builders in the 1940s and 1950s to use asbestos shingles. My parents bought their house in 1949 and lived in it until they died in 2006 and 2009. Asbestos became popular among builders in the late 19th century because of its tensile strength, resistance to fire and heat, and affordability. The prolonged exposure to and inhalation of asbestos can cause mesothelioma, a deadly form of cancer. EVERY YEAR AROUND 3,000 PEOPLE ARE DIAGNOSED WITH MESOTHELIOMA. On average, they are given 10 months to live. That’s 300 days. Fellow blogger Heather Von St. James was one of those who got the diagnosis in 2005. Her daddy was in the construction business. Asbestos fibers were on his clothes that he wore home from work, and she would sometimes put on his coat. 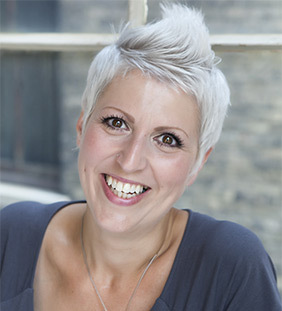 Heather was diagnosed at the age of 36, three months after she gave birth to a daughter. Now she is a 7-year survivor and has made it her mission to spread awareness and hope. Please visit Heather’s page and learn about asbestos today. 1. About 30 million pounds of asbestos are still used each year. 2. Asbestos can still be found in many homes, schools, and commercial buildings. 3. Asbestos was once used in more than 3,000 products, including toasters and hair dryers…some of which may still be in use. The house I grew up in that is covered with asbestos shingles is still there, housing people. So is the house next to it and the one across the street and others on down Deering Street.